Now this is what I call comfort food. 1 tbsp of finely chopped dill. 1. Peel the potatoes and cube them and keep them in bowl. 2. Heat 2 cups of water and boil it. 3. Add 1 tsp of salt and add potatoes. 4. Cook them on medium heat for 30 minutes or till tender. 5. In a large bowl add the boiled potatoes and mash them very well. 6. In a separate bowl add milk, butter, cream cheese, dill and salt and pepper. 7. Now start adding the wet ingredients in potatoes by stirring well in between to make the mashed potatoes light and fluffy. 8. 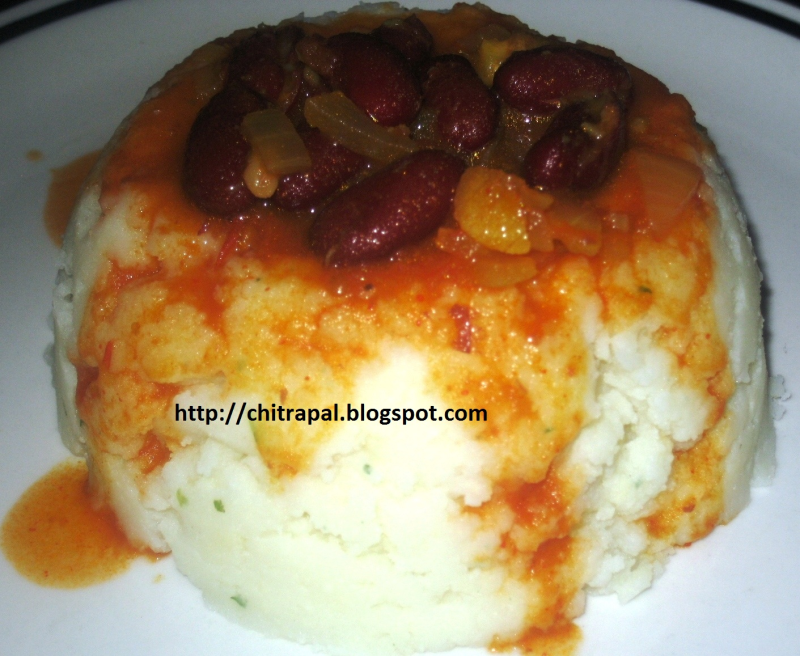 Put the mashed potatoes in centre of plate and pour the beans soup all over it. 9. I used the beans soup which I had some leftover from my lunch; you can make any gravy item for this like chicken soup of vegetable soup or serve like that also as a side with grilled fish or chicken.